On Friday morning, The Flash comics writer Joshua Williamson tweeted a cryptic Howard Porter cover which heralded one of DC’s upcoming big events. It was a shot of pre-Flashpoint Wally holding a Kid Flash costume in one hand and a Flash one in the other, as seen below, and was soon followed by the announcement made at NYCC that ‘Flash War’ would begin. 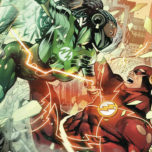 The storyline, which was unveiled during the DC Comics’ Metal and The New Age of DC Heroes panel, will premiere in the Flash Annual #1 on January 31st and run through issue #46. 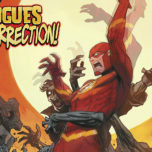 While Williamson hinted that it was a plot that would derive directly from the Metal crossover event and even teased, “Let’s see who’s the best Flash,” it’s hard to imagine that a run that has placed so much emphasis on family and partnership would turn such a hard corner. Then again, Metal has certainly brought out a darker side to many of DC’s most beloved characters – not to mention the Elseworlds versions of them that are popping up in the meantime. 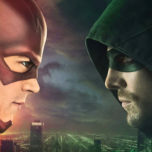 It’s very possible that there could be a grudge or serious issue that needs to be worked out, but it seems a safe bet that The Flash #46 will reveal what each of their strentghs are rather that deciding which of them is the “best.” Hopefully the fans will have a good time with it and no battles to the death ensue. 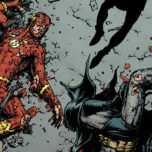 Another question this brings up for me is whether it will in any way tie back to the Doomsday Clock storyline or the memories of pre-Flashpoint that Wally has been holding onto, but which as of yet no one else remembers. Could the younger man harbor some resentment towards his old mentor for past events or forgotten promises? Only a few months left until we find out! Either way, Flash War is sure to be in good hands with Williamson at the helm.